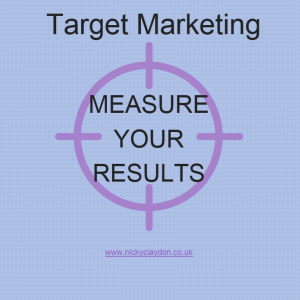 Having defined your target audience and set-up your campaign you then need to determine if you were correct in your assumptions by measuring the results of your Target Marketing. 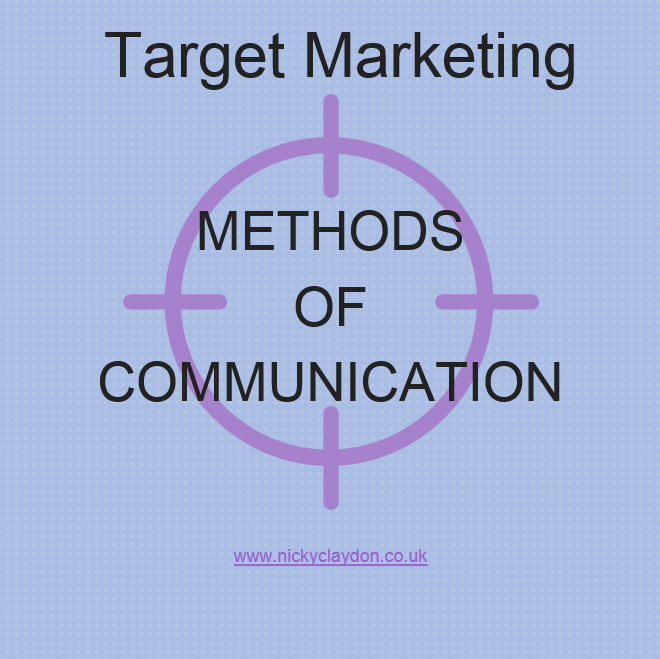 How good is your target marketing campaign? The one thing you mustn’t do is assume that, having finely tuned everything to find your ‘perfect customer’, it will be only these people who buy from you. Often this isn’t the case. You may find that once your campaign is up and running it will be a different audience altogether who end-up buying from you than you originally expected. An audience that you may have previously completely overlooked. This is where being open to good constructive feedback is so important. The resulting information will arm you with everything you need so that you can see where your leads are coming from and tweak your current set-up to do an even better job of your marketing in the future which will give you even better results. Coupon Codes – When advertising or sending out Direct Mail use a coupon code that people quote when they contact you for more information. E-Mail – You could use, say, Get Response or Mail Chimp. Through using their analytics you can track your open rates. Online – use Google analytics, use a Landing Page or use an online feedback programme such as Survey Monkey which is completely FREE to use. Face to Face – meet customers/prospects and ask for their feedback in person. Analysts – employ someone specifically to measure the results of your campaigns. Virtual Assistants (VAs) – if you can’t afford to employ an experienced analyst often VAs are happy to provide a research service for you. Whatever method you choose, to measure the results, this will be enormously beneficial to your business in order to find out the best/worst method of approach to use for future campaigns and tweak what you do next time for even better results. Otherwise you will be completely in the dark as to what works and what doesn’t, which is a complete waste of your marketing budget. This may be something that you have overlooked in the past, due to focusing on the one goal of gaining new business at any cost. 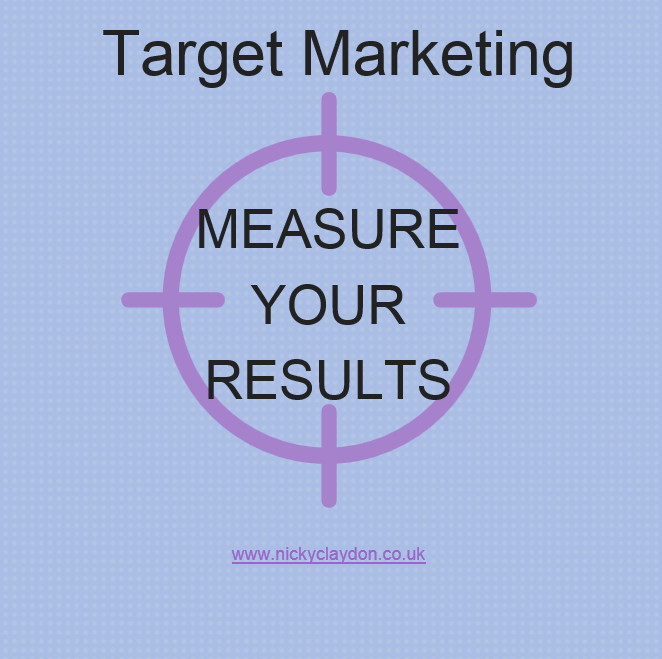 If so, now you are fully aware of the importance of ALWAYS ensuring you measure the results of your marketing campaigns. 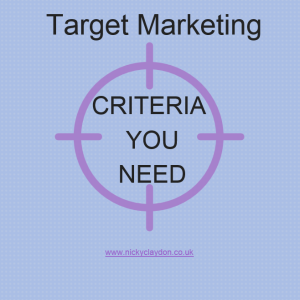 I hope this post has made you think and, together with the other posts highlighting: being specific, criteria, identifying needs and communication channels, you now have a really clear picture of how you should move forward with your Target Marketing strategy to grow your business exponentially. 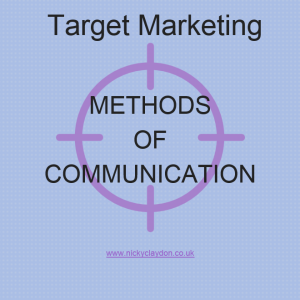 Have you considered whether or not you are using the right method(s) of communication to ensure you are connecting with your ideal Target Market? Or are the methods you’re using a bit random, to say the least! One thing you really need to do is to ensure that the marketing message you are conveying is connecting with the ideal prospect/customer who will buy from you. Your product or service will not suit everyone’s needs so you need to ensure that you are putting your marketing message in the right places to connect with the right prospects/customers. There is no 100% correct answer with regard to the best channels you can use to reach your target audience but what you can be certain of is that the method that is right for one business will not be for another. For example if your business is a retail shop you would want to run a local advertising campaign not a national one as your ideal clients are people from the local community who will buy from you on a regular basis. For this type of business, the ideal thing, initially, would be to place an advert in a local business directory and/or a small local newspaper and to attend a local business networking group. You need to set some time aside to think about how your perfect prospect/customer gets information in order to buy a product/service such as yours. What channels of communication would they use: online search engines such as Google, YouTube, Periscope, local business directories/newspapers, direct marketing leaflets, bill boards, television, radio, etc? Put yourself in the shoes of your ideal prospect/customer and consider, if you knew nothing at all about your product/service, what you would use in order to connect with someone who provides what you do. Again, along with identifying your perfect prospects’/customers’ needs, this is something that many new business owners and even established business owners forget to do. Is this something you’ve omitted to think of? If so, by carrying out this simple exercise this could make you realise that you have been concentrating your marketing efforts in completely the wrong place! If you find out this is the case, make the change now – you’ll be pleased you did. 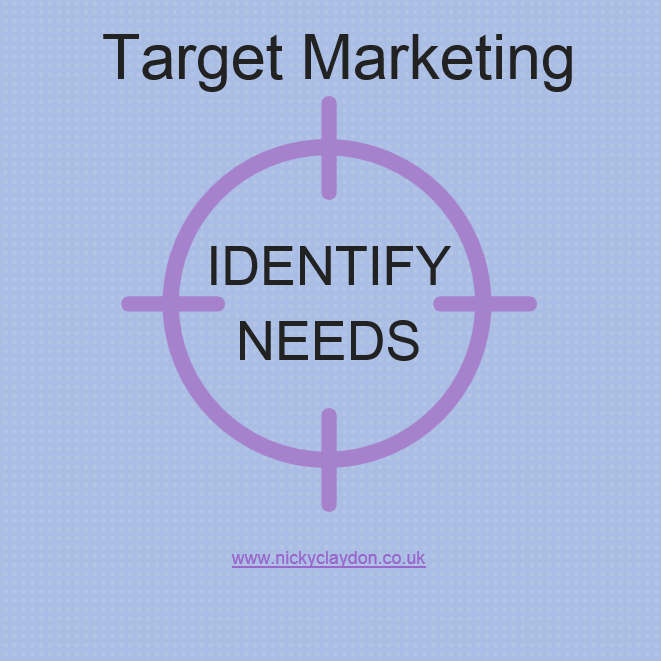 Have you thought about what you need to do to identify your target market? This is so crucial for any business but something that is often overlooked, especially when starting out. What are you prospects needs? The one thing that business owners often forget to do is put themselves in the shoes of their target customers. You need to do this on a regular basis. You need to find out if your prospects/customers understand the benefits your product/service offers as well as you do and if your brand message is clear. There are a number of ways you can do this but one of the best ways is by using a customer feedback survey. Survey Monkey is a FREE online resource that you can use for this purpose. Repeat business. You can’t assume that if you don’t hear from your customers they are happy with you. You need to check this on a regular basis. Happy customers will buy from you again and again. Loyalty. If your customers never hear from you how will they know you are still in business? If you don’t keep in touch and check that they are happy you will find they will defect to the first person who comes along. You need to keep in touch and by gaining their feedback this is a great way. Reputation. It is really important that your customers let you know how they feel about your product/service before they tell their friends. If there are problems it gives you a chance to rectify things and the way they feel about you. If they are happy this becomes a great testimonial for you which you could ask to use, if they are happy to give their permission, and it also lets you know that this is the message they are passing on to their friends. Referrals. You don’t want a customer to have any reason not to recommend you or your service wholeheartedly. This is why is it is really important to check regularly that they don’t have any issues/problems. Remember, word of mouth referrals bring new customers into your business for FREE and the more referrals you get the more your business benefits. Morale. If a customer praises your product/service, this is a huge morale boost and will give you, and also any staff who work for you, masses of confidence that your business is on the right track. It also gives peace of mind that your customer will be loyal to you over the coming years and will refer you often. By seeking feedback you will see the product/service you provide through new eyes which will enable you to spot potential weaknesses, areas of misunderstanding and possibly things that your prospects/customers may object to, find difficult to use or simply not like. Once you have this information to hand you can then set to work and hone your marketing message specifically to fit the needs of the people you are attempting to market to, which should result in an upturn in future sales. Taking this course of action also arms you with the information in order to enhance your 60s pitch, marketing messages/campaigns and working practices so that they will fully cover the needs of the people ideally suited to buy from you. 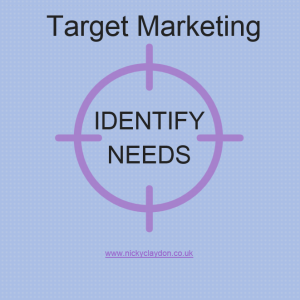 If identifying your target market is something you have not put in place for your business then make sure you do, as soon as possible. You will be encouraged by the huge impact it has on your business. 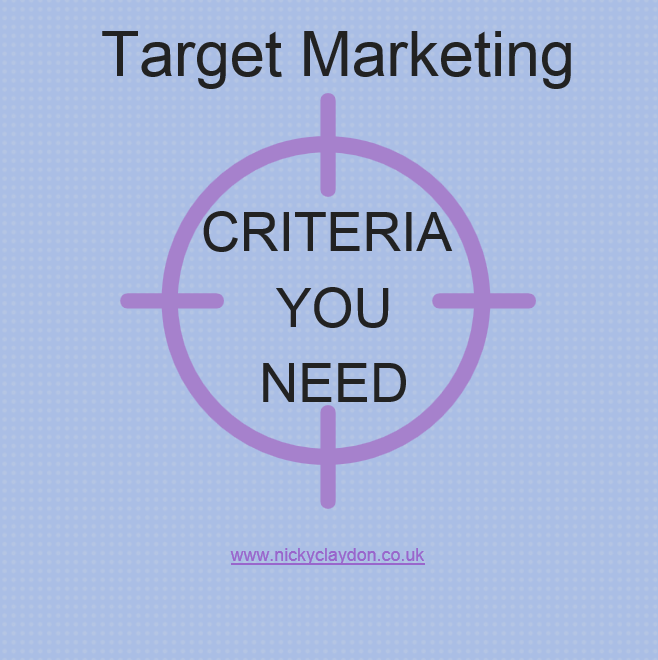 Deciding on your target marketing criteria lays a critical foundation for your business. Ideally this is something that should be considered when drawing-up a business plan for your new business, but if this has passed you by, it is never too late! The better you know your customer the faster your business will grow. It is really important to determine a criteria you intend to use to identity the people you most wish to reach who will become your perfect customer. Your audience is unique to you and your brand, so you must identify the factors that can be used to create a better relationship between their potential needs and what your company can offer to provide a solution to their needs. Ideally you need to eliminate the people for whom an attractive offer from you won’t be relevant or important. By excluding these people, you can then focus your marketing messages to reach the remaining people who will be most interested and receptive to the call to action within your marketing message. 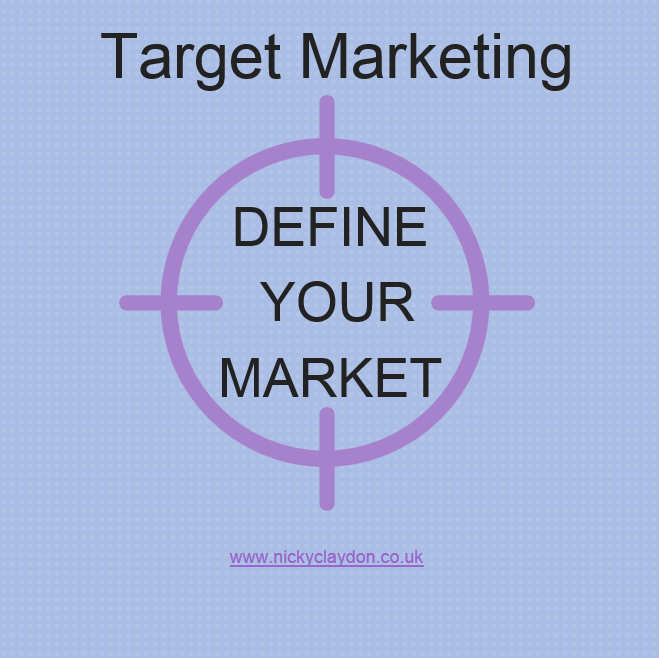 The more you define it the better – this is what’s known as your ‘niche’ market. If you are new in business look at who your competition are marketing to and this can be easily done, these days, via Social Media. If you have an established business and have an existing customer base, ascertain the common traits and interests of your current customers and why they buy from you. Who are your top customers (your VIPs)? If you determine the common denominator of your VIPs, it will then make it easier for you to target people, very similar to them, who could also benefit from your product/service. ValuesHowever, take care not to whittle it down too far!I hope this post has got you thinking. Is this something you’ve overlooked doing? If so, as mentioned previously, is never too late. You will be surprised at the difference it will make to the take-up rate of your prospects. One of the biggest hurdles small business owners face is getting their message out to the right people who are most likely to become their customers. 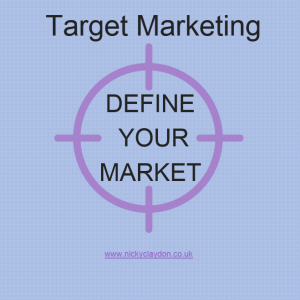 This is where defining your target market comes into play and ensuring you put a Target Marketing strategy in place for your business. When starting a small business, people all too often (especially during the first year of their business) set-off randomly marketing to all and everyone until they suddenly realise that this way of operating really isn’t working for them. Prior to setting-up a business is an ideal time to take stock and really ‘drill down’ as to who are the most likely demographic to buy your products/service(s). However, even if your business is established, is it is never too late to carry out this exercise. If you haven’t thought of this before, perhaps now is the time! It is important to realise that your products/service(s) have a target audience that can be defined. One of the primary goals of your business should be to think of ways of identifying who these people are so that you can promote your business so that your marketing speaks directly to them. It is no good assuming that your products will appeal to all and sundry. It would be great if this could be believed but, generally, it is not the case that everyone will like and want to buy from you. If you want people to sell products on your behalf, say, on a party plan basis then you need to be marketing your business in places where young parents will notice this opportunity to earn extra money as these are the type of people who are more likely to need an income which will fit around childcare so that they don’t have to return to work. Alternatively, the older generation who are retired could also be interested in this type of work in order to top-up their retirement income. If your product is a phone app, it is more likely that the younger generation will buy/promote an app like yours as they are more proficient in using their handheld devices so you need to be marketing where the younger generation will see it and be attracted to it. If you have an existing customer base, look for common characteristics and interests which can give you an indication as to why these customers buy from you? What type of customer brings in the most business? Once you find a common denominator it is then easier to market your product/service to other people like them who will be more likely to buy. This may seem obvious but often considerations like these are often overlooked. If this is something you’ve overlooked doing for your business, it’s not too late. Set to now and put the time aside to define who your perfect target audience is.